Purchase a half-case or more of our wines and receive 1/2 off shipping with checkout code "750m37"
Although I'm not reading as much doom and gloom about the economic state of the wine industry lately, there seems to be no shortage of high quality juice looking to be liquidated by relabelers. There was a good story in the Sunday Globe about Boston-based 90+ Cellars. Another label that's gaining notoriety amongst my deal hound friends thanks to a push from highly regarded local retailers is Banshee Wines. Banshee's goal is "to delivery distinctive wines that beat the pants off many costing twice as much." Their focus is on domestic reds - mostly Cabernet and Pinot Noir - made in a plush, approachable style. In their best efforts they succeed in finding an intersection between high quality, deliciousness, and affordability I seek out as a deal hound. 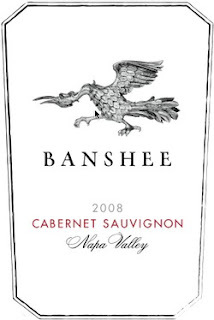 I wrote about the 2007 Banshee Cabernet Sauvignon previously - rating it 93/100 points and assigning it a "Value Alert" moniker. 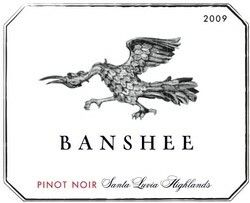 I've recently tasted through more current releases from Banshee and although none rise to the level of the 2007, at least at this point in my opinion, I'm pleased with the pattern I'm seeing. They're putting some very good wine in the market at compelling prices. What was remaining in the bottle the 2nd day was very good which is unusual for a domestic Pinot Noir and a good indication this needs a little time. Medium to full bodied. Dusty blackberries on the nose. Satisfying velvety mouth feel. Some chalky tannins - a little grip. Some acidity. Quite smooth considering its youth. Might improve a little with 2 - 3 years of age but no reason to wait too long to open this one. 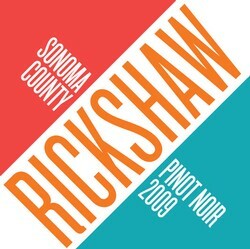 If you can get past the label on their Rickshaw wines you're in for a treat. This wine is nicely transparent visually but clings to the glass due to its 14.6% alcohol and resulting high viscosity. The nose lacks some markers that would otherwise tip its hand as being Pinot Noir when tasted blind, but in its place it there is ample round fruit and a hint of spice. Really pleases with root beer flavors on the palate on top of supporting round fruit. Some acidity. Hard not to like this. 90 points if you're in the mood for a relaxing vacation in southern California, significantly lower if you'd rather be reading a book about Burgundy on a cold winter night. So young it practically tastes unfinished to me. Won't open another bottle for a year. Not Rated - will taste another bottle in a year. Question of the Day: What do you think of Banshee Wines? What are some other relabeling operations you've been impressed with?